Set against the backdrop of the war in Iraq, drastically altered relations with traditional U.S. allies, intense partisanship, and a national debate over moral values, the 2004 presidential campaign presented voters with a clear choice that reflected deep divisions within the country. This collection analyzes this watershed election, and its likely consequences. The contributors examine every aspect of the election, including the strategies and tactics of the Bush and Kerry campaigns, voter turnout and policy consequences, campaign financing, and the power of incumbency. List of Tables and Figures; Preface; Part I: The Context; 1. The Bush Presidency: Establishing the Agenda for the Campaign, William Crotty; 2. Constituencies and the Consequences of the Presidential Vote, Richard J. Powell and Mark D. Brewer; Part II: The Presidential Campaign and Congressional Races; 3. Political Participation in the 2004 Presidential Election: Turnout and Policy Consequences, M. Margaret Conway; 4. The Inevitable Unanticipated Consequences of Political Reform: The 2004 Presidential Nomination Process, Christine L. Day, Charles D. Hadley, and Harold W. Stanley; 5. Financing the 2004 Presidential Election, William Crotty; 6. 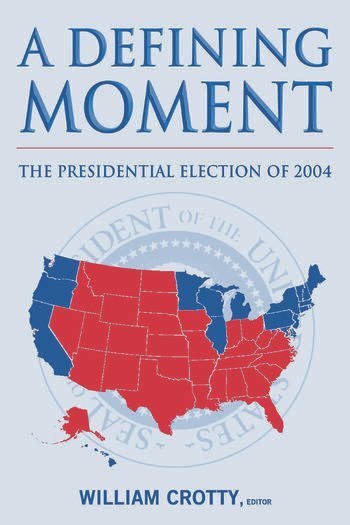 The Presidential Race of 2004: Strategy, Outcome, and the Mandate, Patricia Conley; 7. Incumbency, Politics, and Policy: Detour or New Direction? Jerome M. Mileur; 8. The 2004 Congressional Races, John S. Jackson, III. ; Part III: Conclusions; 8. Holy Owned Subsidiary: Globalization, Religion, and Politics in the 2004 Election, Thomas Ferguson; 9. The Armageddon Election, John Kenneth White; 10. Armageddon, Just Another Campaign, or Something In-Between? The Meaning and Consequences of the 2004 Election, William Crotty; Appendix: Presidential Elections and Party and Candidate Success; The Contributors; Index.